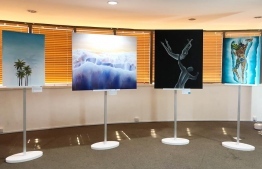 The renowned brand unveils their first Exhibition in Male. Pillar of the pantheon of Maldivian art, Oevaali is a brand synonymous with quality, variety and outstanding marketing. Founded by sisters Raniya and Raya Ahmed Mansoor, managed and owned alongside partners Ismail Ajuwad Rasheed (Imma) and Ali Ajeel Rasheed (Ajikko), Oevaali Art Shop has contributed greatly to the art of transforming the 'true essence of the Maldives' into art and design. 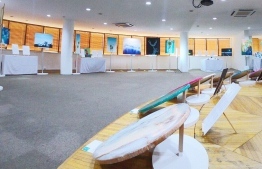 Oevaali Art Shop, since it's opening in 2015, has focused on building a lifestyle brand of beautiful art and products inspired by the ocean and the seaside. Further amplifying their brand, Oevaali held a much-anticipated art exhibition, in June 2018. 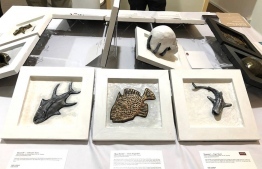 Dubbed 'Heritage Through Folk', the exhibition was held in Malé and local art lovers revered the display of the pristine artistry. I am lucky enough to have attended the art exhibition. And am extremely appreciative of the digital liaison with the members of Oevaali, which provided me with 'behind-the-scenes' information supplementing to the various elements of 'Heritage Through Folk'. This two-part coverage will be a review and an interview, both discussing the work and worth of this art exhibition. Having located the STELCO building, East of Ameenee Magu, I found my way to the building's elevator and made my way to the fifth floor. As I got out, I caught a whiff of what I can only describe as 'smell of newness', a scent I often associated with very clean rooms with unclouded air. I was already pleasantly interested. Not too far from the elevator stood a display stand with a neatly placed, written piece of paper. I approached it to get a closer look. 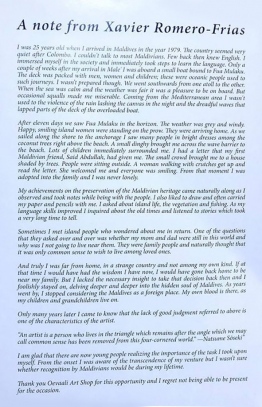 Titled 'A note from Xavier Romero-Frias for Heritage Through Folk, 2018', followed an overview of the Maldivian culture and its association with the art exhibition. A prologue of sorts contributed by Spanish author and scholar Xavier Romero-Frias. Intrigued, I make my way into the Auditorium Hall where the art pieces were displayed. The hall was well lit, spacious and even from a distance, I could observe a welcoming flow to the classification of the display. 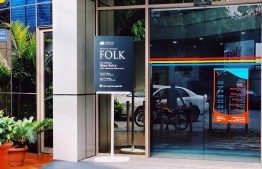 The hall had four main nodes consisting the art, and all the spaces had accessible circulation to the artworks and enough capacity to socialise. In addition to the works of the four members of the Oevaali team, the exhibition also catered to artworks of multiple contributing artists. The hall was jam-packed with colourful art: on paper, canvases, as sculptures and even on wooden boards. From where I stood, I anticipated an evening of glee and elation. Contributing artists included A. Aima Mustafa, Maisha Shareef Yoosuf, Ismail Maaish Mohamed, Mariyam Izza Moosa, Mariyam Shany Ahmed (Manje), Aminath Ula Ahmed, and Aminath Shareehan Ibrahim. The demographic mostly composed of the younger generation. Cool kids with a knack for art and social gatherings. I questioned where I placed on this spectrum. Determined regardless, I approached the first space of the exhibition where a lanky boy stood sipping a juice box. Curiously, I asked him if the art at that corner was his work. 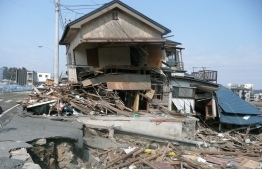 He hurriedly shook his head and walked away. 'Queer', I thought but continued to try and fulfil my anticipation of enjoying the pieces of art, with or without any of the artists present. The first space included art by the contributing artists. 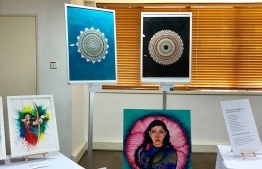 From the sultry cover girls illustrated Mariyam Shany Ahmed (Manje) to the intricate mandalas by Mariyam Izza Moosa, I was captivated by the colourful talents-on-paper. Adding to the magic was the 'cool' aesthetics by A. Aima Mustafa, as well as the lively hues of the 'Kai'dha' series by Aminath Ula Ahmed. Some pieces were truly outstanding, making the kind of impact that simply jumpstarted the rest of the display. Moving on to the second space, I came across a rectangular table dotted with perfectly arranged sculptures and a well-dressed man standing next to it, this time not sipping a juice box. I questioned him about whose work it is, and he happily claimed it to be his. I had met one of the artists in person! Introducing himself as 'Imma', he proceeded to explain to me the concept and artistry that went into concocting these sculptures. Conversation with him was pleasant, friendly and he made me feel very comfortable in this tedious process of explaining the creative. Wanting to know more about the concept behind the exhibition itself, I pressed him further, and he invited over a young woman nearby, who introduced herself as 'Raniya'. Excited to have met another member of the Oevaali team, I conveniently immersed myself into the content of the dialogue. We delved into a discussion of art, and it's importance in the Maldives. They also lightly shared their process of preparation for the exhibition as well as their keenness to be affiliated with even more artists in the future. Amidst the brewing art-talk, I brought up the choice of venue as it was something I had really wondered about. Raniya happily replied that there wasn't a particular reason for it, adding that she was ecstatic that many people made the effort to visit the exhibition regardless of it not being held at one of the more popular 'artsy' venues. Contented after this tête-à-tête, I moved on to experience the third space of the exhibition. This third space included art by Raya Mansoor. Although I couldn't have the pleasure of meeting the artist in person, I did enjoy the delicately painted strokes that flowed over each piece of canvas. 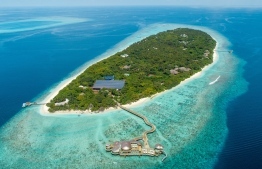 Raya's collection was a conglomerate of folklore and the geographical sheen that the Maldives boasts. 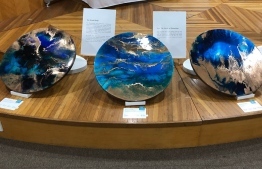 One of the pieces, titled 'With the sea', was definitely a show-stopper; metallic hues 'ombre-ing' smoothly into the darker colours in beautiful harmony. The young artist's collection was aesthetically pleasing throughout and proved to be a vital addition to the exhibition. Wandering in accordance with the designated 'art zones', it was then time for the fourth space of the exhibition: a resin art collection and perhaps, the most awaited portion of the exhibition. I too wanted to explore these tangy colours and I approached the man manning these pieces with much enthusiasm. No juice boxes in sight. Introducing himself as 'Ajikko' he began expounding the pieces one by one. He credited his partner Raniya immensely for having selected the colours for most of the pieces and reflected on the process of creating art alongside Raniya. The colours of the resin art pieces were bold, contrasting and dramatic, inspiration clearly drawn from elements of Maldivian folklore. Impressed beyond words, I thanked him for taking the time to explain his work to me, and expressed what a wonderful job the team of Oevaali had done in assembling the entire display. Having explored all nodes of the display, I gestured a goodbye to the friendly faces inside the auditorium hall and started towards the exit. Overjoyed after the 'artful experience' and having personally met three out of the four members of Oevaali, I looked ahead: to the bright future of art in the Maldives and the elevator doors that opened to the fifth floor. 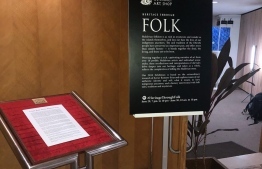 As I got on and turned around, I again caught a glimpse of the display stand I had seen at the entrance, with the words 'A note from Xavier Romero-Frias for Heritage Through Folk, 2018', highlighted vividly. The elevator doors closed subsequently, instilling a yearning in me to find out more about this fantastic exhibition. Editor's Note: Part Two of Oevaali Art Shop will be published on August 23, 2018.